I’ve never been a terribly big fan of Dusty. It’s not that I don’t like the character, it’s just I’ve never found his figures to be terribly interesting. It kind of surprises me that I have so many modern versions of Dusty. The Pursuit of Cobra version is great and I find myself strangely drawn to the 50th Anniversary version as well. Dusty, from the Sneak Attack three pack, isn’t anything super fancy, but he’s still a solid figure and a nice addition to the 50th Anniversary line. I’d not realized how simple Dusty’s construction until I popped him out of the package. From the neck down, he uses almost all of Pursuit of Cobra Jungle Strike Duke’s body while his head comes from Pursuit of Cobra Desert Battle Dusty. The parts mesh together surprisingly well. I’ve always liked the Jungle Duke body and I like seeing it here as well. The pants are simple but still have a military vibe, and I know I’m in the minority here, but I still find myself liking the reactive armor look for some Joes. The bare arms work well for Dusty, even if he is a desert operative. I kind of see this as a night operations Dusty, so he doesn’t need to keep his arms covered to prevent sunburn. The arms are wiry and give Dusty an appropriately strong look. 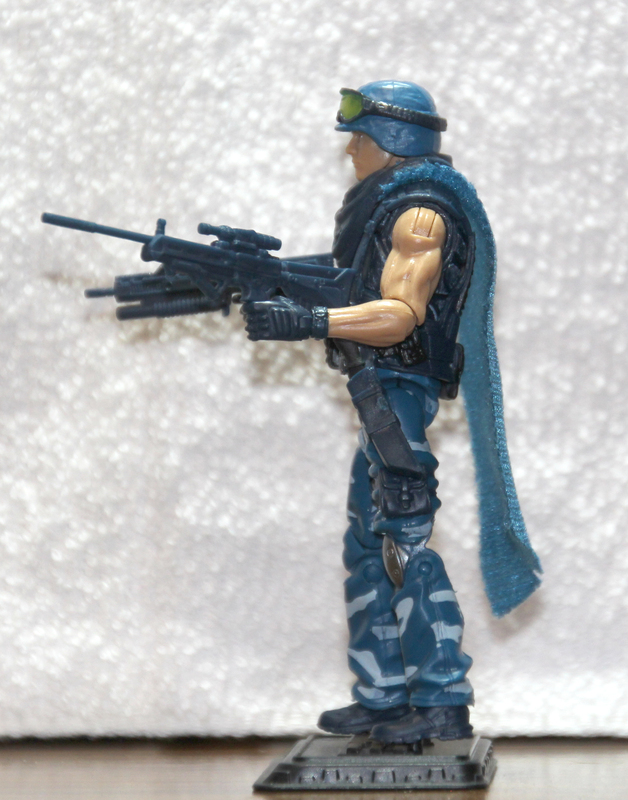 The arms are a pairing of Jungle Duke’s upper arms with what looks to be 30th Anniversary Renegades Duke’s lowers. They work well together and it’s nice to see Hasbro mixing up the parts just a little bit. The Renegades Duke lower arms also give him the great added wrist articulation. Over the torso, he’s wearing the same webgear from Jungle Duke and Pursuit of Cobra Dusty’s cape. You wouldn’t think those two pieces would work well together, but they do. The addition of the Pursuit of Cobra Dusty cape helps distance the rest of the body from Jungle Duke and it doesn’t make me feel like I’m displaying a repaint of a figure I’ve had for quite a while now. Up top, the Pursuit of Cobra Dusty head looks as good as ever. While it is getting a little overused because it’s such a generic piece, it still works well for Dusty and it’s the smart choice here because it is a better piece than the 25th Anniversary Dusty head. Despite his simple construction, Dusty works well and I find myself strangely drawn to the figure even though I’ve never had any real attachment to the character. I’ve mentioned before that I kind of see this as a night ops version of Dusty and the big reason for that is the paint choices Hasbro made for him. This version of Dusty is primarily a dark-ish blue. That’s a color we’ve never seen used on Dusty before and I find it kind of refreshing. I do kind of wish the base blue was a tad darker, but it’s still a great color. To break up all the blue, Dusty has light blue camouflage on his legs and a gunmetal gray kneepad. Up top, the cape is blue with a black wrap plus there’s black on the webgear’s pouches. 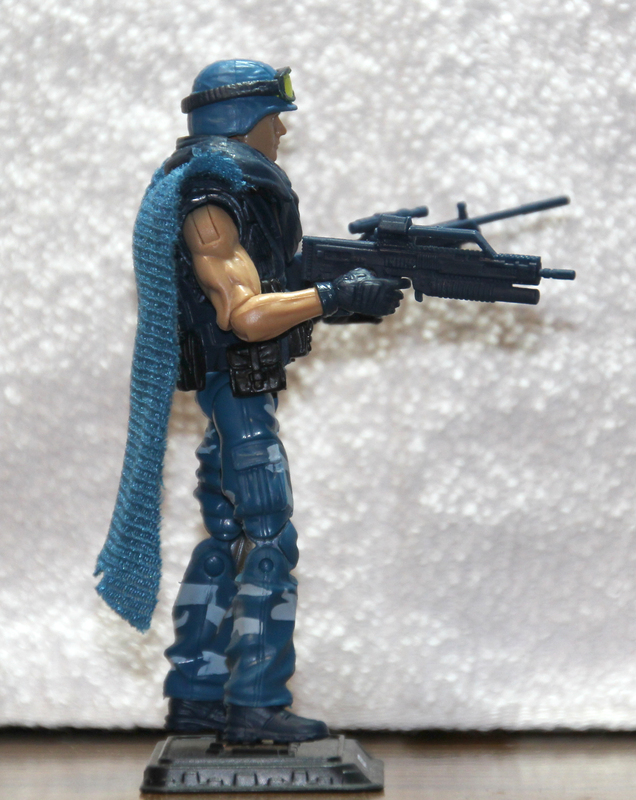 Dusty’s skin is a bit tanner than most Joes, but it works since Dusty is still a desert trooper. The paint work on Dusty’s head is excellent and his eyes look fine, which has always been a bit of a problem in the 50th Anniversary line. Dusty’s look is simple, but it’s something we haven’t seen before, so I really find myself enjoying it. Dusty’s gear works well for the character and I don’t know why, but I find myself loving the mostly color-coordinated weapons. They remind me of my childhood Battle Corps figures and for some reason, that hits a weird nostalgic soft spot with me. 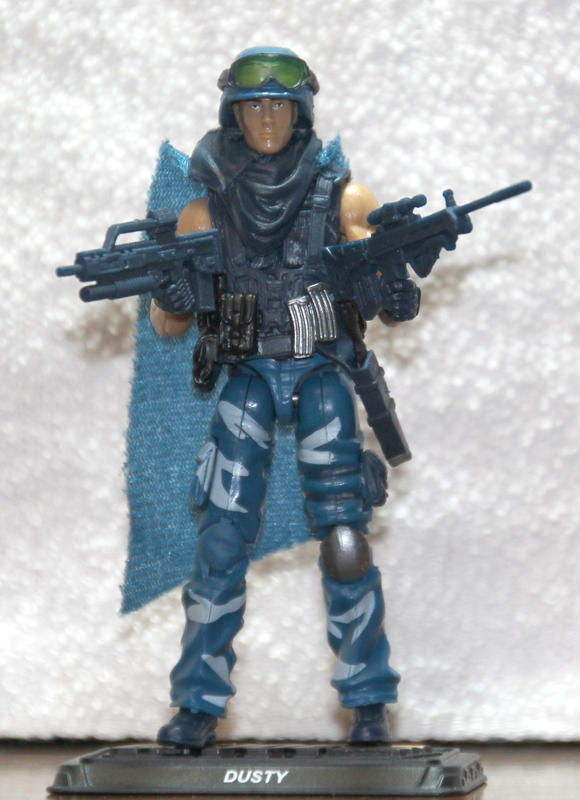 For smaller weapons, Dusty has a pistol and the machete that were originally included with Jungle Duke. I swapped the pistols between Dusty and the Firefly from this set because the thinner pistol fits better in Firefly’s holster. I do wish Dusty had a functional holster just so he could carry all his gear, but that’s neither here nor there. Up top, he has the same helmet that came with Pursuit of Cobra Dusty but they swapped out the goggles for the ones that came with Pursuit of Cobra Hawk. I’m kind of torn because the Hawk goggles are slimmer but they can’t slide down over the Dusty helmet like the original, larger goggles could. It’s a small complaint, but the Hawk goggles just don’t fit the helmet as well as the Dusty goggles did. Dusty’s weapons are the same two that came with Retaliation Agent Mouse. That means Dusty’s got a nice sniper rifle and a slightly futuristic assault rifle. I like the idea of Dusty being at least somewhat cross-trained in sniping. After all, there aren’t a lot of Joe desert fighters, so I can see Dusty taking up the sniping duties out in the field when he’s working out there alone. The assault rifle is a great piece and I like seeing it here again. It hasn’t gotten a lot of use over the years, so it still feels fresh. Plus, it’s another piece that reminds me of the weapons that were used in the Aliens franchise, and that’s just a great pop culture reference to make. This version of Dusty is a pretty simple figure, but something about the simplicity just works for him. Jungle Duke is one of my favorite early Pursuit of Cobra figures and the design still holds up well after all these years. Plus, the sleeveless look reminds me of the 1991 Dusty that KansasBrother had when we were growing up. It’s a nice reference to a less loved version of Dusty, I only wish they’d swapped out the helmet for the removable beret just to complete the reference that I see in my head. 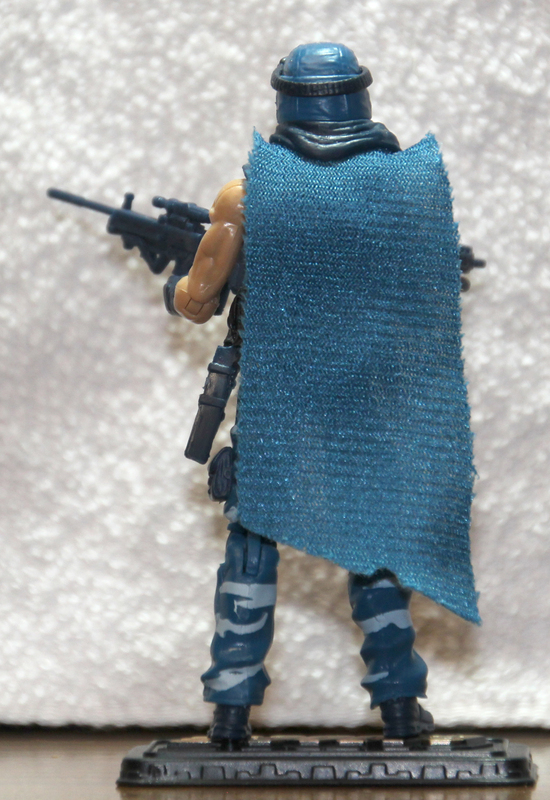 I know we’ve got Wolf Squad, but it will be interesting to see if there are some other Joes coming that will rock this great blue camouflage color scheme. It’s a nice look and it’d be a shame if we didn’t see it again. I don’t know what you’d call the subteam that uses it, but it’s definitely got some potential. My favorite is the original Dusty. Capes seem more inline with Emperors, arms dealers who command their own personal army, and dentists.